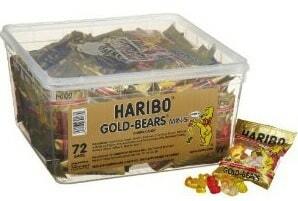 Hairbo Gold-Bears Gummi Bears only $0.15 Per Bag, Free Shipping! Get 72 single-serving bags of Haribo Gummy Bears for only $11.04 with free shipping when you order with Subscribe & Save. That means each bag ends up being just $0.15 each! Head over to Amazon to see the deal before the price flips. For those not familiar, look for the Subscribe & Save option at the right side of the page. Select the $11.04 price option and complete your purchase.